Southern Locomotives Ltd's volunteers have driven the company's success over the past 25 years. 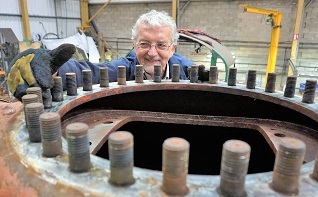 From our roots in an open yard at Blunsdon to our current home in Swanage volunteers have provided a large proportion of the thousands of man-hours needed to restore a steam loco. Today we have around 30 active volunteers, some who live close to Swanage and others from Devon, The Midlands, London, Kent, etc. Bob Waterman checks the threads on the dome before the cover is re-fitted. Chris Worby and Ray Grace installing the superheater elements in 34072's boiler. Local volunteers tend to adopt a regular schedule (e.g. every Wednesday and Thursday) and focus on specific tasks. Those from further afield come for two-day sessions which we schedule every three or four weeks to attract a larger group, typically 6 - 8. Their work will be determined by what's needed on those dates, and the skills of those coming. They stay locally on the Thursday night and enjoy an evening out in the high-spots of Swanage! We are also arranging volunteer work at Tyseley to assist the overhauls of Manston and Sir Keith Park. 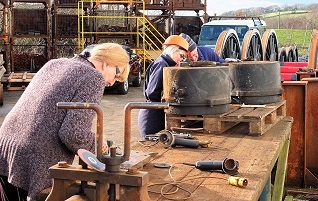 Claire Sheppy, Mary Bosworth and Stuart Magnus clean up components which have been stripped from Eddystone prior to its overhaul. 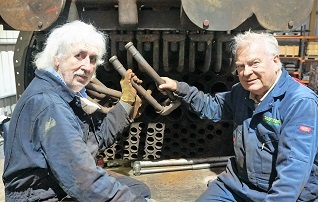 Nick Thompson and Jim Bosworth fit new brake shoes to 80104 following its overhaul. We're a friendly bunch, and we welcome new volunteers. Whether you're highly skilled or just a generally handy person there will be work for you to do. The pay is terrible (i.e. nothing) but the tea is hot. Most tasks are tackled by small groups, so there's someone to chat to and to help each other out. Work is assigned on the basis of an individual's ability and willingness to do it. The safety of you and those about you is the top priority. You will need to bring overalls and steel-toed boots. Other equipment is available from our stores, though you may prefer to bring your own hat, goggles, gloves, etc, which are needed for some tasks. Please note that we work between Monday and Friday, and the works is not generally used at weekends. If you live locally and would like to find out more you are welcome to call in at Herston Works and ask for Willie or Bob. Alternatively please call Simon Troy on 01474 833263 for a chat. 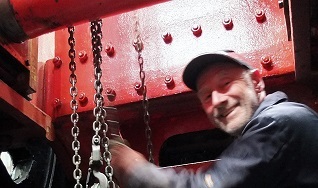 Malcolm Garner gets ready to lift one of 34072's main springs with the aid of a block and tackle. 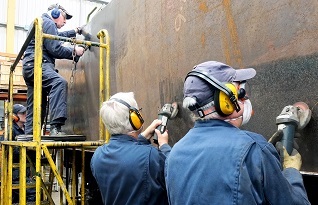 There's a major maelstrom of productivity as four volunteers clean up the new tank of 34072's tender. Southern Locomotives Limited – dedicated to restoring, operating and maintaining Southern's steam heritage. Based on the Swanage Railway, Dorset, UK.